More than half of the telecommunication satellites in the orbit have Tesat devices on board. Today, one is convinced that global communication is only realisable by going into outer space. Tesat is one of the first companies to develop and supply devices for the optical broad band communication in space. These terminals are able to communicate data and pictures via laser beams between the satellites, and from the satellites to Earth. Benefits of the laser communication are, for example, the high digit rate of currently 5,5 Gbit (this equates to 200.000 DIN A4 pages) per second and their insensitiveness to disturbance. July 25th 2013, the Alphasat took off. This is the biggest European telecommunication satellite with a takeoff weight of more than 6.6 tons and a span of 40 meters. It has four technological demonstration systems for the European Space Agency on board, among them a laser communication terminal developed by Tesat-Spacecom on behalf of the German aerospace centre. The terminal serves as preparation for the European Data Relay Satellite System (EDRS) and permits very high binary rates between the Low Earth Orbit (LEO) and the Geostationary Earth Orbit (GEO). So the utilisation for Earth observations and services should improve greatly. It is a challenge for all engineers to build the alignments of the mechanisms and optics on exact fractions of one degree, because of the giant distance between the communication satellite and Earth (this being 36.000 km, approximately three times the Earth diameter). During a test, the laser beam reached, as desired, the control centre in Tenerife exactly at the programmed moment. The confirmation of the alignment accuracy was a significant step in the preparation of the first data transfer by laser from the Alphasat satellite. Alphasat is now in full-load operation. 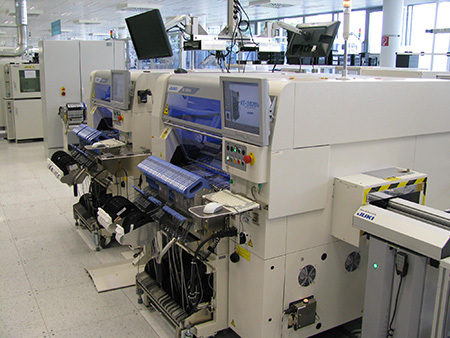 The requirements for quality, traceability and for First Yield Pass are very high in the SMT production of Tesat-Spacecom in Backnang (Germany). The whole production is subject to the strictest worldwide norms of the European Space Agency (ESA) and fulfils the ECSS standard. Only PCBs that are a 100 % accurately assembled and produced are allowed for further use. Repairs are not permitted. The traceability has to meet the highest requirements. Each step, from the components construction up to its placement on its PCB position is retraced automatically and without gap. Until the satellite is in the orbit, the costs add up to approximately 300 million Euros. PCBs from Tesat can cost some 10’000 Euro and are though very significant industrial goods. 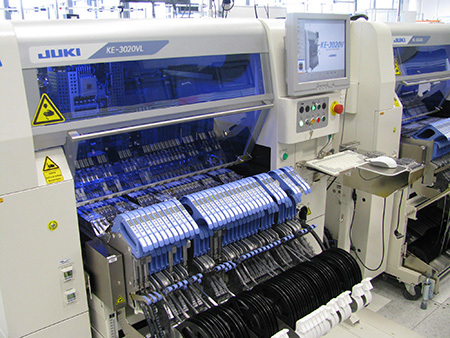 The configuration of the Juki line is unique, because two 3020V IC mounters operate consecutively. Therefore 1:1 redundancy is reached and that’s normally also requested for the satellite systems in space. All quality controls, such as fully intelligent electrical feeder with 100 % traceability, electrical component measuring, high precision laser controlled coplanarity etc. are all set up on the systems. “Pioneering with passion” – about 1.200 employees develop, produce and supply systems and devices for telecommunication at Tesat-Spacecom in Backnang close to Stuttgart (Germany). The product spectrum consists of highly reliable devices such as travelling wave tube amplifiers, multiplexers, switches, modulators and optical terminals which are supplied, together with complete systems, to all leading satellite manufacturer worldwide. So Tesat offers the whole communication technology which is necessary to emit television signals over the antenna of a satellite into all households. More than half of all telecommunication satellites out in the orbit have Tesat devices on board. With the focus on commercial cosmonaut programs and participation in military and institutional programs Tesat generates a turnover of 328 million Euro. At this time, over 600 aerospace projects have been conducted.